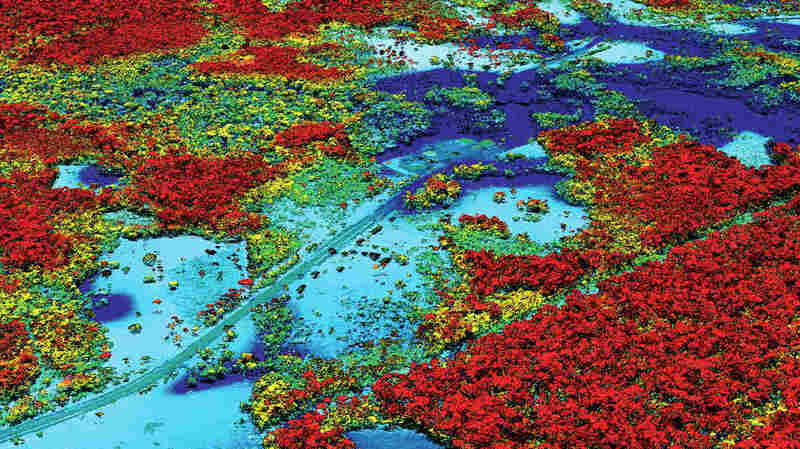 Ecologist's Airborne Scanners See The Forest And The Trees — All Of Them Gregory Asner has loaded a plane with lasers, spectrometers and computers to create models so detailed, they distinguish between and count plant species in even the densest biomes, like the Amazon. A scan produced by Gregory Asner's airborne, laser-and-spectrometer-equipped lab. In today's world it can be easy to feel like there's nothing left to discover, that all the blank bits of the map have long been filled. Gregory Asner begs to differ, and he's developed a lab in the sky to prove it. In the Carnegie Airborne Observatory, Asner has designed a one-of-a-kind, ultra high-tech, airborne laboratory — inside a twin-turboprop plane. It offers a faster, more exhaustive way to map how humans have destroyed land, from the deserts of the American southwest to the deepest depth of the Amazon. The findings have opened up a whole new field of ecological surveying — and now, 10 years into the making, Asner is attracting worldwide attention from governments bent on making better decisions about the environment. "If your environmental science is not policy-relevant today, we really don't have time for it," he says. At 46, the fast-talking Asner looks the part of the modern-day explorer: nature-loving, intense, a hint hyperactive. He's just flown in from Borneo, where he was presenting his methods to government officials. Today, he's at the California headquarters of his observatory, which is part of the Carnegie Institution, a scientific nonprofit. Tomorrow, he'll head to Peru. Norway just announced a donation of $300 million to Peru to protect its tropical forest and reduce greenhouse gas emissions — a pledge based on the exclusive results gathered by Asner's extensive mapping of the country — so he needs to go present his findings. Asner uses state-of-the-art technology to uncover the canopy's secrets. From his vantage point at 6,300 feet up, a forest might seem like an indistinguishable mass of green. But his Airborne Taxonomic Mapping System (AToMS) has much better eyes. 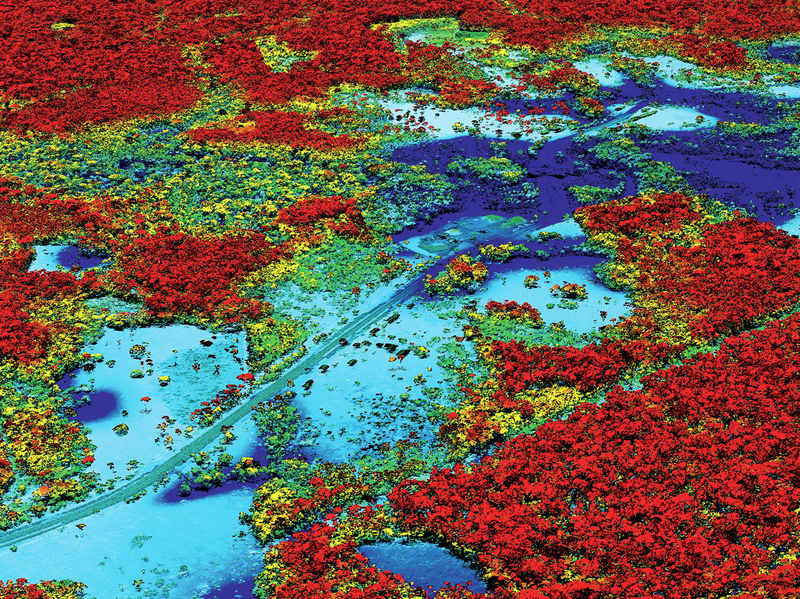 Its a combination of lasers, spectrometers and other instruments sees the forest as a detailed 3-D model, down to each and every branch, identifying different species of vegetation and even how much carbon they store. It's a huge efficiency upgrade from traditional land surveying, which requires scientists to walk around the jungle counting plants. Still, AToMS has a hard time tracking species that don't keep still. "You still need to have a biologist on the ground like myself trying to count monkeys and butterflies," says William F. Laurance, professor at the Centre for Tropical Environmental and Sustainability Science at James Cook University and director of ALERT, the Alliance of Leading Environmental Researchers & Thinkers. But a fancy, flying lab gives Asner access to places scientists never would have been able to reach before, although there may still be risk involved. On one occasion, he and his team mapped more than 6,500 square miles of the Colombian Amazon at night — about the size of Connecticut plus Rhode Island — flying with all their lights out to avoid being shot at by the FARC, the Colombian rebel force. Weather conditions are also a challenge, so he's put his $10 million worth of equipment inside a sturdy, German, military-style plane that can withstand any storm or dust cloud. "Things often get pretty crazy up there," he says. Asner never set out to become an eco-warrior. Originally from Maryland, the self-declared "nerd" grew up fascinated by two things: science and Hawaii, which he though was "the coolest of the states." He moved to the islands after completing his undergrad in engineering and got involved in local conservation projects, which led to his earning a doctorate in biology and doing post-doc fieldwork in the Brazilian Amazon. It was there, in the heart of the jungle that he decided there should be more efficient ways to conduct environmental surveys. But it took almost 10 years and countless setbacks before he perfected his technology for mapping a forest's biodiversity. Today, his airborne survey services are in high demand. This year he plans to undertake a complete scan of Ecuador, as well as help the Malaysian government in its efforts to restore the country's heavily depleted forests. Because he has only one aircraft and four full-time team members, he often has to turn down solicitations, and scaling up his operation is proving costly and difficult. He's spent millions of grant money on automation and the development of cutting-edge software, but despite his programs' political and academic successes, he has a serious shortage of volunteers to teach. "My biggest worry is my inability to train someone to replace me," he says. "Even my son — he's 16 — is totally uninspired by what I do!" The lack of human resources could limit his influence and reduce his ability to chart remote territories like the North and South poles or the world's most inaccessible mountain systems. Highest on Asner's dream list is to use his plane to map coral reefs — when he's not soaring over tropical forests, the biologist is often beneath the waves pursuing his lifelong passion for diving — but that dream will have to wait.